Every once in awhile you get a look beneath the surface of things, usually when something breaks. 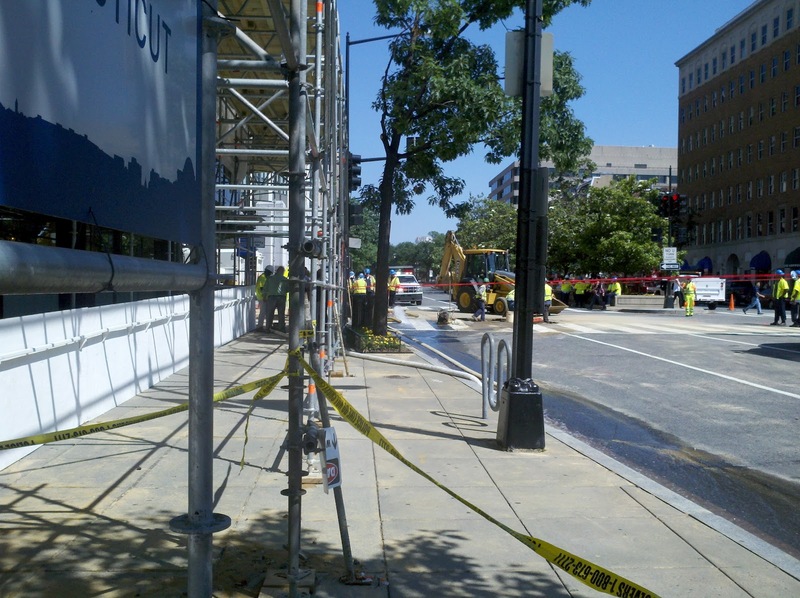 Today it was a water main outside the Monthly office building, which meant that every building affected had to be closed by order of the fire marshal. You can see in the picture I took quite a lot of water was running down the storm drains, but that's nothing compared to the garage flooding nearby. Here's a little local news segment on it. Apparently the main was 65 years old, which is actually younger than the DC average of 77 years old. (In case you're bad at math, that means the average pipe was put in 1935.) Some DC pipes are even older, dating back to the 19th century. As you might expect, this isn't the only time a pipe has burst--just by accident I found the story of another broken main in DC from earlier this month. Apparently, there are an average of 450 breaks a year. It's a nationwide problem, of course, due mostly to neglect, which is only getting worse, because no one wants to pony up the money. We have literally trillions of dollars in unmet infrastructure needs. We have massive unemployment in the construction sector. Materials are unusually cheap because of a depressed global economy. Borrowing is unusually cheap because we're one of the few safe havens left in the global financial market. And it's cheaper to repaid an aging bridge today than rebuild a crumbled one 10 years from now. So waiting to do the bulk of our infrastructure passing a half-measure on infrastructure investment later is like waiting till after the big sale ends to buy your groceries. It's just bad financial planning. It's not a choice between big and small government, it's a choice between effective and hapless government. That we can't see that is a symptom of the political system's increasing inability to even try to address major challenges.